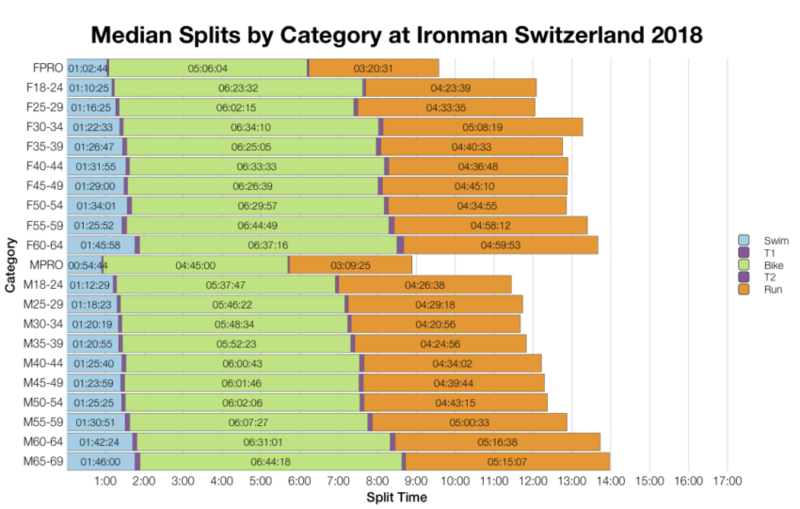 After a busy weekend of Ironman racing I’ll open the analysis up with Ironman Switzerland. It’s a mid-sized, European race with a field in excess of 1,500 athletes and the regular allocation of 40 age group Kona slots. The course is just on the faster side of average for a European race. This year’s event trended slightly slower than the amalgamated results of the previous 10 years. This is concentrated in the swim and run splits, both of which trend slower, while the bike time is largely comparable to previous events. The shift isn’t huge by any means and likely represents the minor variation in result statistics from year to year. DNF levels at this years race don’t appear to be anything exceptional. A little higher on the bike, but nothing exceptional. Run DNFs looking to trend in line with recent years. 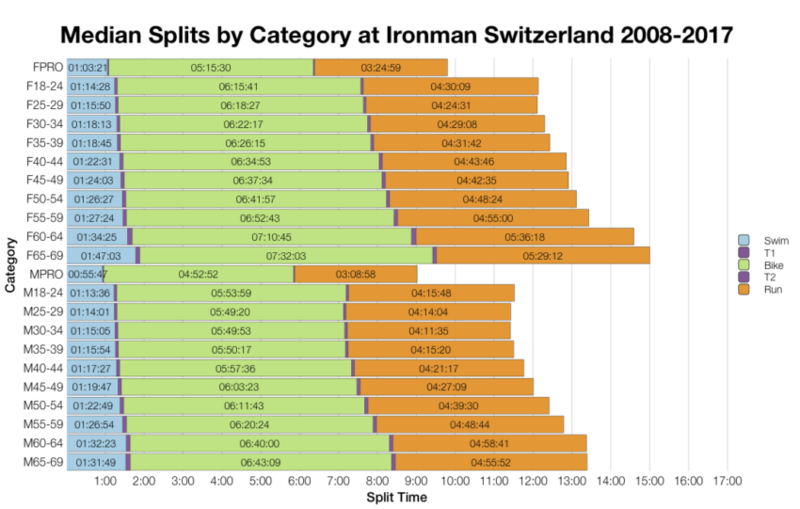 Age group medians follow the distributions with slower swim and run times. 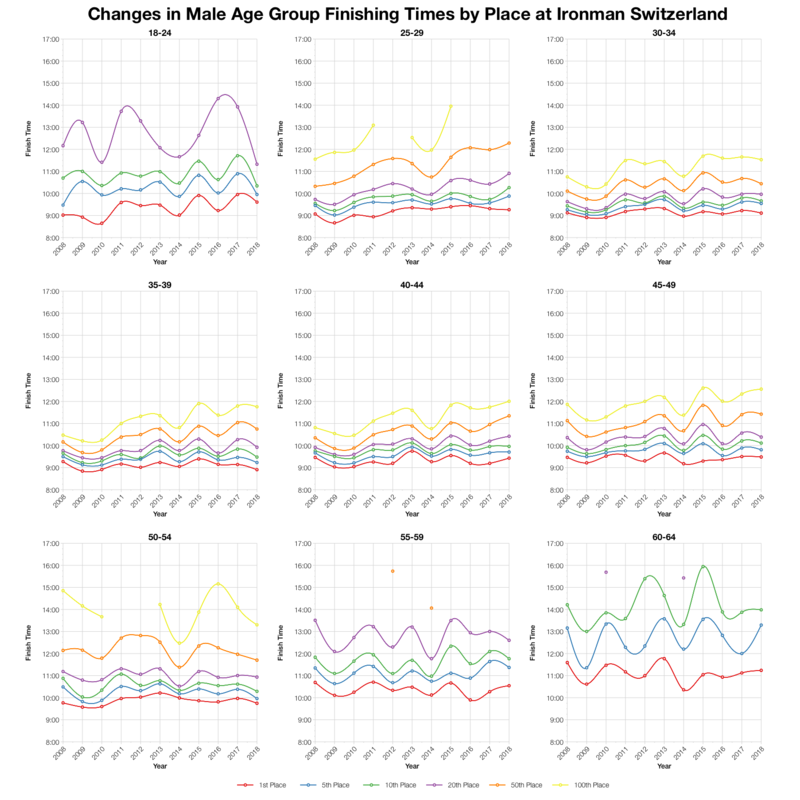 Bike splits are more variable, with some age groups faster than usual, some slower. 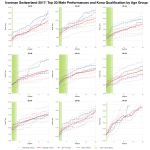 A broad mix of nationalities race in Switzerland. Most of the Kona slots stay at home or go to Germany with a few going further afield. Tracking specific age group placings over the last 10 years shows a lot of variability. Depending on the age group and the position this year’s times can be faster or slower than we’ve typically seen. 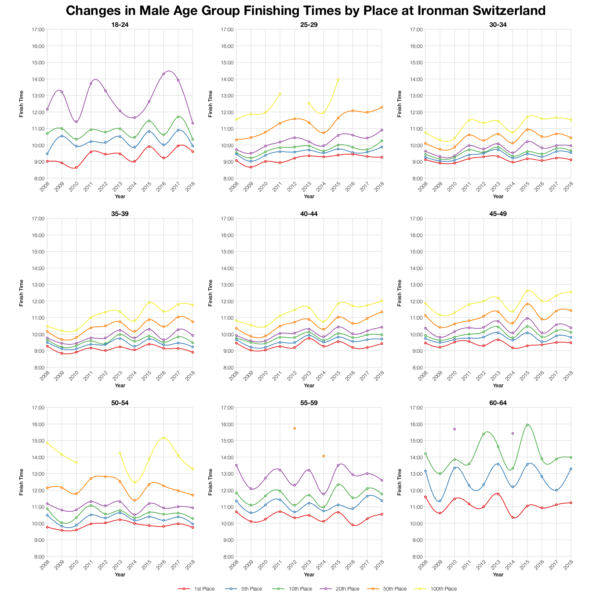 The biggest male age groups, where the majority of the field is found don’t vary too much from previous results. Based on the start numbers I’ve estimated the slot allocation in Switzerland and from that the automatic qualification times in each age group. Final numbers may vary and roll down will influence the final qualifying time. You can compare with other races on my Kona qualification page. 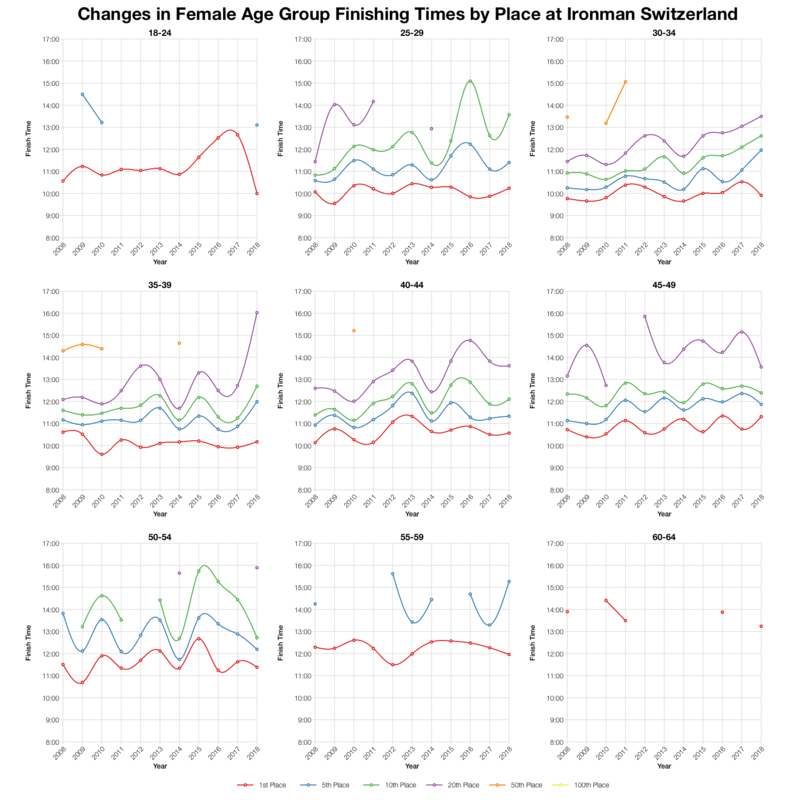 There is age group variability, but for most, this year’s top twenty times trend slower than the average. 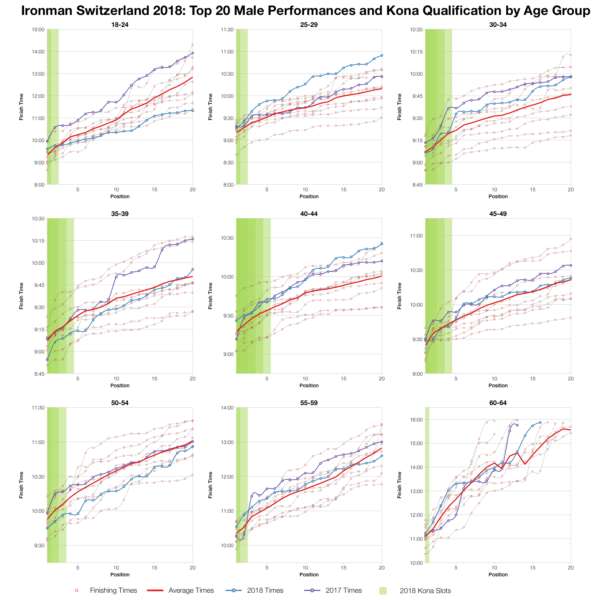 The M35-39 age group is the clearest exception with times pushing ahead of the average line. Overall though this year’s race looks to have been slightly slower for the course. 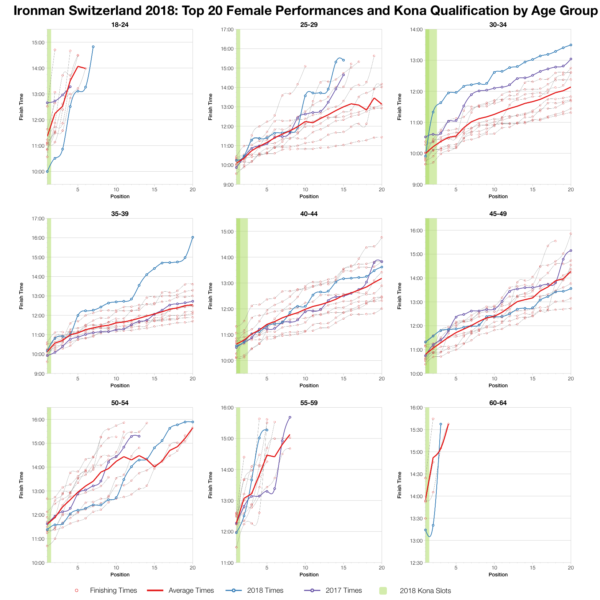 You can access a spreadsheet of the full results from Ironman Switzerland 2018 on my Google Drive.